3.5mm Male Jack Plug to Female Socket Cable 5m. 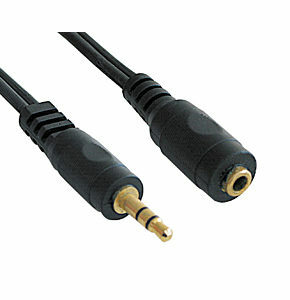 Ideal for use as headphone extension cable. 3.5mm male jack plug to 3.5mm female socket. Component Video Extender Over CAT5 Twisted Pair, 100m. Extend component video YPbPr / YCbCr over a standard UTP CAT5, CAT5E or CAT6 twisted pair cable up to 100m. Network cable supplied separately. Connections: 3x Phono socket, red green and blue. Gold plated connectors. Maximum cable lengths: 480p: 100m 720p: 75m 1080i: 50m. (CAT5e / CAT6 UTP cable). Passive, requires no power. 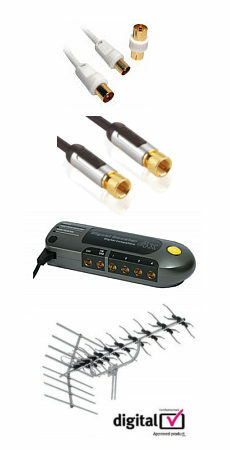 Supplied in pairs 1x transmitter and 1x Receiver. Scart to Component Cable 5m High quality 5m scart to component cable, scart to component video. Features cast metal scart plug and phono plugs. Gold plated contacts for perfect picture transfer. RGB colour coded phono plugs. Please note the scart must be plugged into a component video compatible scart (YUV / YPbPr), please see note below. 3 way TOSLink Optical Switch Kit with 4x 1m Optical Cables. Allows switching of one optical source/load to three optical loads/sources. Finished in a stylish silver/grey with rotary blue selector knob. Red dot indicates which input/output is selected.